As the city consolidates the individual “legroom” that used to characterise Berlin’s incompleteness shrinks. 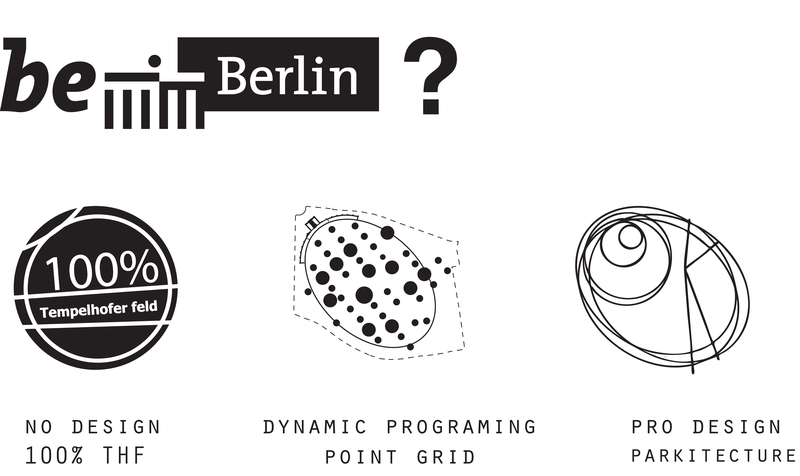 The future of Tempelhofer Freiheit, the last unresolved inner-city area is currently debated between top-down PRO-Park and bottom-up NO-Park. A petition to not build anything opposes the current city master-planning schemes, while Pioneer fields are designated to play in residual corners of the field. This project proposes to structure the vast open field with a continuous point-grid framework, only indicated by focal points. These points prescribe a minimum order and orientation, but more importantly allow for flexible open zoning of indeterminant programs. The circular enabling fields can easily be adjusted in scale by shrinking and growing their radius. They are only signified by the grass mowed shorter, resulting in a minimum physical intervention with maximum programmatic flexibility. infiltrate, recharging the groundwater, and dynamic programming incorporates the nature preserves since ecosystems thrive on disturbance. Park management constantly monitors and anticipates programmatic demands. Instead of fixing and determining the park and its program this design is a framework for curating the full scope of informal to institutional programs. The design of the park is adaptable, and can be updated weekly, for example on the occasion of the next World Cup a series of soccer fields would be provided. Other cultural, sports and arts events Philharmony, Bread & Butter and DMY already reside in the hangar and would benefit from corresponding outdoor space in the park. The anticipated collisions of scheduled events and everyday park users instigate unforeseen encounters – precious moments that have become rare in many parts of the city. This proposal goes back to a competition entry for the Park Tempelhofer Feld. Design Team 2011: Jorg Sieweke with Jenny Jones, Beth Bailey, David Malda, Tom Hogge. Design DMY 2013 Aja Bulla-Richards and Design Interventions in the field 2013 Grey Elam. Next Next post: Daily Mowing Updates: Tempelhof Freiheit!